BERMUDA -LEEWARD KEYPLATES & VARIETIES. BELOW IS THE DIRECT LINK. 对于中国请注意，我非常建议注册的邮件（有条件的运输选项）作为最常见的邮件发送正常邮件失去. ДЛЯ РОССИИ ПОЖАЛУЙСТА, ОБРАЩАЙТЕСЬ, Я ВЫСОКО РЕКОМЕНДУЕТ ЗАРЕГИСТРИРОВАННУЮ ПОЧТУ (ЭКСПЕДИРОВАННЫЙ ВАРИАНТ ПЕРЕВОЗКЫ ГРУЗА) КАК САМЫЕ ИЗДЕЛИЯ ОТПРАВЛЯТЬ РЕГУЛЯРНЫЙ ПОЧТОВЫЙ ПОЛУЧЕНИЕ ПОЛУЧИТЬ ПОТЕРЮ. 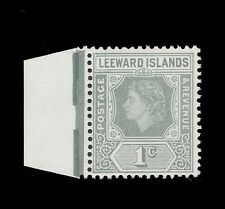 Leeward Island 1954 QEII set of 15, very fine unhinged/unmounted mint. SG 126-140. Tone spot on top right side on stamp also showing on reverse. INTEREST-FREE CREDIT OPTIONS UK Personal Cheque. SG112b - Catalog value £ 35. LEEWARD ISLANDS 1938-51 KGVI 5s green and red on yellow ord paper, MNH. MNH - Mint Never Hinged. MNG - Mint No Gum. Used - used and in a good collectable condition. MLH/MM (etc) - a mix of MLH and MM with the majority being MLH. MLH - Mint Light Hinged - lightly hinged no hinge remainders. NEW HEBRIDES SMALL COLLECTION M & U, UNCHECKED!. This is the Leeward Islands set in mounted mint condition. The scanner tends to show the gum a shade or two whiter than it really is. In this case the gum is yellowish. There are heavy hinge marks. 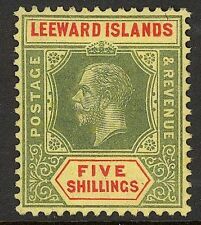 Leeward Islands 1902 set to 5s, SG 20-28. Fine used, CDS. Catalogue value £200 . Rest of the world: GBP £2.30. We will invoice you with the correct amount. Fine used, CDS. Catalogue value £133 . Unmounted mint. UK (second class) - Free. If you are outside of the UK you can request your bank to draw a sterling (£) cheque which is acceptable. MM - previously hinged (usually one hinge) or hinge remainder. The scan shows the actual item(s) that you will receive. Condition mixed. Good study lot. Sg1 1/2d dull mauve & green. Sg2 1d dull mauve & rose. Sg3 2 1/2d dull mauve & blue. Sg4 4d dull mauve & orange. Sg5 6d dull mauve & brown. 1902 KEVII set to 5/- excluding the 2½d (8) ex SG 20-28 mounted mint, original gum, previously hinged. Leeward Islands. MNH - Mint Never Hinged. Used - used and in a good collectable condition. MLH/MM (etc) - a mix of MLH and MM with the majority being MLH. FU - Fine Used. VFU - Very Fine Used. MNG - Mint No Gum. MLH - Mint Light Hinged - lightly hinged no hinge remainders. 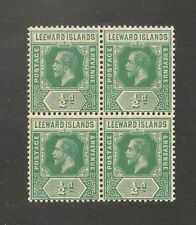 Leeward isl Sg126 - Sg140 1954. A fine m/mint set of 15. SG109 - Catalog value £ 32. LEEWARD ISLANDS 1938 KGVI 6d deep dull purple and bright purple, MNH. UK ORDINARY (UPTO £40 TOTAL) £1.00. UK RECORDED (UPTO £100 TOTAL) £2.00. 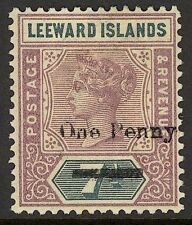 LEEWARD ISLANDS 1890 1/- SG 7 used. SG Cat £60.